The 3-inch M3 gun was the primary anti-aircraft weapon of the US Army and Marines at the beginning of World War II. Its origins lay in the first anti-aircraft gun produced by the United States during World War I, the 3-inch M1918, itself a derivative of the 3-inch M1898 coastal defence gun. Although reasonably useful in defending against the slow and fragile aircraft of that era, the increased speed and manoeuvrability of inter-war aircraft meant that longer barrages would be needed to bring them down. The M1918 had a fixed lining that required the weapon to be re-bored periodically, which was not practical for a gun that would see heavy use. Therefore in 1927 the 3-inch M1 with a removable liner was introduced, followed a year later by the 3-inch M3. A firing solution was provided to the gunners, including azimuth, elevation, and the required time settings for the clockwork fuses. If the solution was accurate the shell would be fired and explode near the target, spraying shrapnel which would hopefully bring it down. However, optical firing proved somewhat inaccurate, especially as aircraft continued to increase in speed. Later models of the Sperry director such as the M7 could take inputs from the SCR-268 fire-control radar, which was much more accurate than optical fire control. The M7 could also train and elevate the guns automatically, with the crew only required to set the time fuses and load the shells. 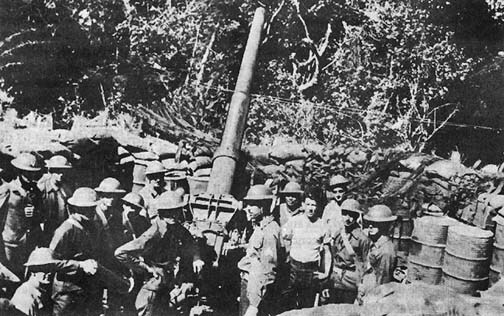 3-inch M3 gun was standard anti-aircraft equipment for the Marine Defense Battalions that defended the far-flung islands of the Pacific during the first months of the war. At Wake Island, Marine gunners brought down several G3M bombers from the Chitose Kokutai even though the island lacked any form of radar. At Midway, Marine M3 batteries directed by SCR-268 radars shot down or damaged so many attacking Japanese aircraft that no significant damage was done to the facilities there, requiring a second attack which was never delivered due to the sinking of all four of their carriers. The US Army also made extensive use of the 3-inch M3. In the Philippines, several batteries had been supplied to MacArthur’s forces but these were by no means adequate to protect all of the bases in the islands. Therefore the guns were mainly concentrated around Clark Field and the Manila Bay area, leaving other areas completely undefended. Three more anti-aircraft regiments were earmarked for the Far East, but they had not left the continental US before the war began. The units that faced the Japanese were further hampered by the quality of the ammunition they were supplied with, most of which had been manufactured 10 years previously and had degraded over time. One estimate claimed that only one-in-six shells exploded when fired, the remainder beings ‘duds’. Even before the start of the war the US Army had been seeking to replace the 3-inch M3 with a more powerful weapon, tendering for new ‘heavy’ and super-heavy’ weapons. In 1938 the 90mm M1 was selected as the heavy weapon to replace the 3-inch M3, and it had replaced the older gun in front-line units by the start of the Guadalcanal campaign.